Augustus Bove House known since the “horse and buggy” era as one of the finest “summer hotels” of the area -having been visited by such notable personalities as opera star Enrico Caruso and Joseph P. Kennedy. Open since 1984, David and Arlene Stetson, your hosts, welcome you to the AUGUSTUS BOVE HOUSE, one of the first summer hotels of the area. We are open year ’round, so reservations are recommended and always appreciated. Enjoy a full, HOMEMADE BREAKFAST which includes fresh fruit or fruit compote, fresh muffins and breads, cereal, juice, coffee and tea, as well as a cooked main dish such as french toast with ham, or pancakes with sausage, served with homemade blueberry or apple walnut syrup. Quaint, romantic, secluded, this getaway is the perfect place to unwind. Feast your eyes on the most beautiful fall foliage in the world. 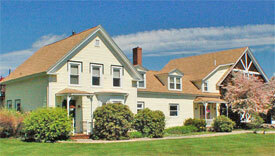 With over thirty lakes in the surrounding Lake Region, the area boasts excellent fishing, boating, and swimming. The Innkeepers and Support Staff at the White Pines Inn seek to provide clean, comfortable and safe accommodations, so that you may enjoy a worry-free stay in the Sebago Lake Region of Maine. 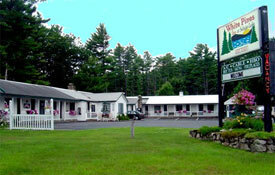 Conveniently located on U.S. Route 302 in Raymond, Maine, close to Saint Joseph’s College and the neighboring towns of Windham, Casco, Naples, Gray, Standish and Sebago, the White Pines Inn offers year-round motel and lakefront lodging for business and pleasure travelers. 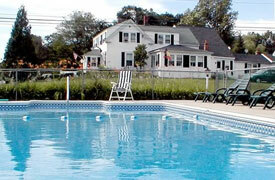 Lakeview Inn is a classic New England B&B located just steps from the shores of Long Lake and only a few minutes drive from Sebago Lake State Park. Similar to a small hotel, a grand main floor welcomes you with relaxing dining and sitting areas with the focal point being the huge original stone fireplace. The sixteen guestrooms, located on the 2nd, 3rd & 4th floors, all offer new furnishings and private baths. Each room is uniquely decorated with some offering king beds and lake views. 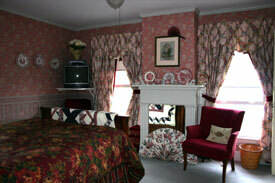 The motel, newly constructed in 2003, consists of six gorgeous rooms, spacious, ultra comfortable, and well equipped. One room is especially designed for handicapped persons complete with “drive-in shower”. In the middle is the laundry room, iron and iron board. Each room has two beds, Queens and Fulls. There are fridges and microwaves in all rooms. The TV’s offer a 70+channel line-up including sports and news. A high-speed internet connection plugs right into your lap-top, without dialing in! All rooms have a phone with front-desk service, incoming call transfer and free local calls. Summers in Maine can be pretty hot. To keep you and your family cool, we installed high capacity air conditioners in the rooms and renovated the 20 x 40 swimming pool for your enjoyment. 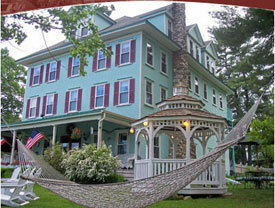 Lamb’s Mill Inn Nestled on 20 Acres in The Heart of the Western Lakes and Mountain Region of Maine. Step back in time to 19th Century country elegance, beautiful gardens, a restful and peaceful ambiance and sumptuous country breakfasts. Romance awaits you in the heart of Maine’s Sebago-Long Lake Region. Lamb’s Mill Inn is located in the small picturesque village of Naples, Maine, just 28 miles west of Portland and 25 miles east of North Conway, NH. Nestled on 20 acres of field and woods, this charming old farmhouse was built by Frank Lamb between 1860- and 1870 as a private residence.